Posted on July 24, 2013 by Hillary T.
It’s been a hot sticky summer so far. This may not be ideal whether for us humans, but the ticks are loving it. And if there’s one thing you don’t want to bring home with you after a trip outdoors, it’s a deer tick. 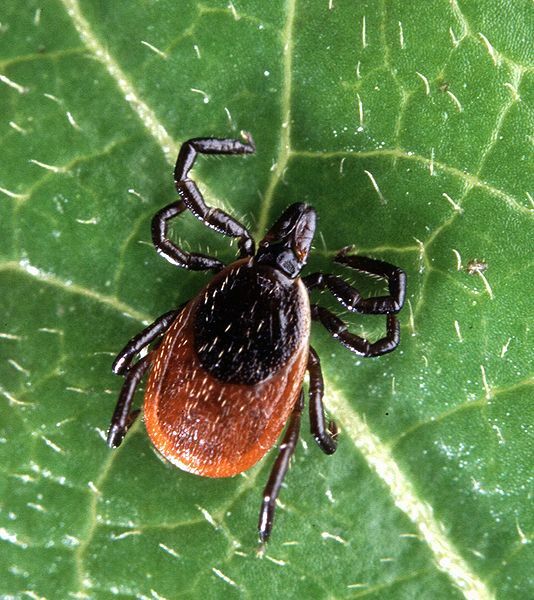 This pesky insect thrives in the summertime and is the primary culprit of Lyme disease in Massachusetts. There are two types of ticks common in Massachusetts: the deer tick (I. scapularis) shown here and the dog tick. An adult deer tick is substantially smaller than the more common dog tick, however size is not always a useful indicator since an engorged tick can be several times the size of one that has not fed. It is far better to avoid ticks altogether than to attempt to differentiate between deer ticks and dog ticks. Step 1: Scour your clothing. Ticks latch on to clothing from the top of low-lying vegetation, such as grass and shrubs, so pants are a good place to start. Once clothing is removed, throw it in the wash. Step 2: Scour your body (or your kid’s body). Ticks like to hide in crevices. Be sure to look under the arms, behind and inside ears, around the hairline, through the scalp, behind knees, between toes, inside belly buttons, and around the waist. Step 3: Take a warm shower or bath. This may help dislodge any ticks that haven’t yet attached. And also provides another opportunity to look for any stragglers. If you discover an embedded tick, use fine-tipped tweezers to grasp the tick as close to your skin’s surface as possible and pull straight out with steady, even pressure. If you wish to have it tested for Lyme, immediately place the tick in a sealable plastic bag. Cleanse the bite area with rubbing alcohol and wash your hands with soap and water. Make a note of the date as well as the location on your body where the tick was discovered and call your doctor to determine next steps. Our website provides more information on ticks and the diseases they carry as does the Massachusetts Department of Health and Human Services. This entry was posted in Nature Notes and tagged lyme disease, ticks on July 24, 2013 by Hillary T..
Now that summer is over you can stop worrying about ticks, right? Think again. While summer in New England is a prime time to spot deer ticks (the chief culprits of Lyme disease—a potentially serious bacterial infection), many don’t realize that they can still pose a serious threat in the fall. This is especially true for those who love a good old-fashioned roll in a leaf pile. Know Where They Hide Contrary to popular belief, ticks do not jump or fall from trees; in fact, they’re blind and find their hosts by crawling to the top of low-lying vegetation, such as grass and shrubs, where they wait for passersby to latch onto. And, since tick bites are usually painless, most people don’t even know when they’ve been bitten. Keep a Tidy Yard At home, keep your lawn mowed short and your yard clear of leaves and other brushy debris. If your property abuts a wooded area, adding a three-foot-wide wood chip or gravel border around the edge of your yard can help prevent tick migration. Watch Where You Walk Stick to wider trails and avoid overgrown pathways in their preferred habitat: wooded or bushy areas where the ground is covered in high grass or leaf litter. Dress Right Don light-colored socks, pants, and a long-sleeved shirt and tuck in everything (pants into socks, shirt into pants). While this look isn’t likely to win a fashion awards, it will allow you to spot ticks, which can be as small as a poppy seed. Perform “Tick Checks” Upon heading indoors, perform a full-body “tick check,” taking special care to inspect the areas between your toes and the backs of your knees, as well as your groin, armpits, neck, hairline, and ears. Remember to check your children, pets, and gear, too! If you discover an embedded tick, use fine-tipped tweezers to grasp the tick as close to your skin’s surface as possible and pull straight out with steady, even pressure. If you wish to have it tested for Lyme, immediately place the tick in a sealable plastic bag. Cleanse the bite area with rubbing alcohol and wash your hands with soap and water. Make a note of the date as well as the location on your body where the tick was discovered and call your doctor to determine next steps. For more information on ticks, the diseases they carry, and how to avoid them, visit our website or the Center for Disease Control’s tick website. For information on Lyme disease, visit the CDC’s Lyme website or check out the special “Living with Lime” series produced by WBUR. This entry was posted in Nature Notes and tagged advice, nature, ticks, tips on October 1, 2012 by Heather.